Yiruma (also known as I Ru-ma or Lee Ru-ma) is a popular pianist and composer from South Korea who received his musical training in London. His beautiful piano composition River Flows in You was originally released on his 2001 album entitled First Love and has become an international hit. 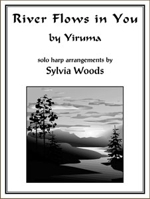 This sheet music includes two 4-page solo harp versions of this piece arranged by Sylvia Woods. Both arrangements include fingerings. The first arrangement is in the key of G and can be played on a pedal harp, or a lever harp with 2 octaves below middle C. The second arrangement, in the key of C, can be played on various size harps. If you have a 26-string harp with 1 octave below middle C, play both hands an octave higher than written. This piece is often erroneously listed on YouTube as being Bella's Lullaby from the Twilight movies. This is incorrect. This music has never been used in Twilight, but it is still very popular with fans of the series.